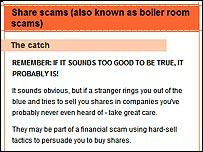 Would-be investors are under continual threat from fraudsters who run so-called "boiler rooms". BBC News explains what they are and how to avoid being conned. So what is a boiler room exactly? Typically it involves a few people sitting in an office, often somewhere abroad, who call you on the phone and try to persuade you to buy shares in a company. A Hollywood film called Boiler Room was released in 2000 featuring just such an operation. They are not authorised by the Financial Services Authority (FSA) or other national regulators to sell shares or give investment advice. The shares they sell may not exist or else eventually turn out to be worthless. And they use high pressure sales techniques to get their victims to part with their money. They are a complete fraud. Are there many of them around? You will not find them under "B" in the Yellow Pages. But the FSA knows of many targeting UK investors. They operate from places like Spain, the USA, Switzerland, Eastern Europe and even Japan. With a large and wealthy population and well-established culture of share ownership, the fraudsters clearly think that people in the UK are an ideal target. And the tough British laws about share dealing make them reluctant to chance their luck within the UK. Hang on, people cannot be that gullible, surely? In June 2006 the FSA surveyed people who called it for advice on boiler rooms. The authorities discovered that victims were losing on average £20,000 each to the con men. Most of the victims were men, over 50 and living in London and the South East. Intriguingly, a majority claimed to be experienced investors. So how do the conmen do it? Sheer persistence and a persuasive line in patter appear to be the key ingredients. Many of the victims contacted by the FSA said they had been subjected to repeated calls from the boiler rooms until they gave in and finally agreed to hand over their money. Persistence does pay off if you are a fraudster. Why do the authorities not close down the boiler rooms? The conmen usually operate abroad where the FSA simply has no powers. If they do operate in the UK though they can be prosecuted if caught. Two men were arrested in the UK in November 2007 because of their suspected involvement in a boiler room. What should I do if someone calls me offering cheap share investments? Do not believe a word of it. Just put the phone down and then give the FSA a call at its contact centre on 0845 606 1234. The authorities are always keen to know of the latest scams.